…by the way i saw a huuuge loss in one of your real account with a max drawdown of 78%, can you tell me what happened there? gap? super bad news? Probably that’s the reason for not having any trades. News filter active is for very conservative trading. You should disable it. If you would like to keep it enabled, there will be less trades and it would be probably a good ideea to raise the risk %. We traded for almost 2 years without the news filter and our accounts are just fine. Considering the you are on demo tou should disable it and see how the robot will handle the trades when there are high impact news. Anyway the market is really really quiet lately at 21gmt so we are getting less trades than usual. Stopping the trades when high impact news occur will result in almost no trades due to the actual market condition. Are there any different trading times worth trying? I have decided to take a rather radical approach to trading times, because I want to see many trades by the EA without having to wait for months to get them: my trade times are set to 22.00 to 21.59 GMT (23.00 to 21.59 for XAUUSD, because of the daily break from 22.00 to 23.00 in Gold trading), enabling the EA to trade 24 hours per day. I’m having it attached to EURUSD, GBPUSD, EURGBP, and XAUUSD; pair defaults are off, S/L = 20, T/P = 15 (200/150 for XAUUSD) with money management at 2%, mm option = 2, all filters (including news) off. After the first 20 or so trades, I’ll post again here, giving some details. This ‘unlimited demo’ idea has worked well with me: I have never before used an EA, always having preferred to trade manually. And I’d never wanted to spend money on something I could not assess beforehand. So being able to test an EA exhaustively before having to spend (or waste) money on it has made me try out an EA for the first time during many years of trading. @tradingshed: No there are not other trading times that worth looking at. We have tried everything. Altough some seem to work excellent, sooner or later something not nice WILL happen. You gould have months in a row with high profit but also that profit could be erase in a day if you use wrong settings. For other trading times please see our firts post in this thread about our future plans. Oliver1968, nice to see you on our thread. We are glad that you consider offering the free demo as a good thing. This is what our intention was, to be open to our future customers. There are a few things to to say here though. Having the demo for free, gives you the chance to try anything at no cost. But, the settings you just posted WILL NOT work 100%. SL of 20 pips is way too low, it doesn’t give the trade space to breath. Any conclusion that you will draw based on the test you are currently making WILL be wrong. I can see that you are somehow new to automated trading. I must tell you that you try certain settings AFTER you have check them in backtest and see how they performed in the past. I am very curious what made you choose the settings you mentioned and the XAU pair. Also I have to tell you that backtests are not the easyest part of automated trading. MT4 history data is not the most complete one, it has wholes in it so modelling quality can go as high as 90% only. If you want better accuracy when backtesting you have to use Dukascopy’s history database which has 99% modelling quality. But that doesn’t go back to the '90s. Its only four years old, but good enough to see how an EA behaved in the most recent market condition. Long term backtests, even if they are only 90% modelling quality are very important to see if the EA survives ANY market condition without blowing the account off. So they are a must. After making all the decisions based on backtests, you try a forward test on demo too se if your conclusions validate in live trading. Even at this point, some EA may experience loosing streaks instead of winning ones, because trading live is not all as pink as it seems. That is why we offer our long term live account to anyone interested to learn about ForexRealProfitEA. And that’s also why we have launched ForexRealProfitEA to the public after we had more than 6 months of real account trading and made adjustments to the EA to make it work with real money in real trading conditions. Second, you don’t have to wait for months untill trades will take place. Check our live accounts, we have an average of 4 trades/day, with more than 2700 trades in a little short of 2 years of live trading. Having said all this, I am really curious about how your demo test will go. It could have a first excellent week, with very high gains, but it could also have a desastruous start. You never know without taking all the necessary steps before going live. Please use the correct time frame for trading (only from 21 to 22 GMT). Any other time frame will be a waste of time and money and will lead you to wrong conclusions. Our future updates will trade all day long for some currency pairs, but not this version of the robot. Automatic trading is based on statistical probability, it’s not that smart as manual trading, but it has big advantages also. You can test the strategy for very long periods of time, you can adjust a correct money management to the system and it trades without “feelings”, so human errors generated by panic are overcome. this first test was not meant to evaluate the EA in regard of profitability, but was just done to have the bot open a large quantity of trades, so that I could get a general feeling of its workings and functions. Like I’ve said in my post above, I have always traded manually before, so I needed to see an EA in action, to be able to judge frequency, slippage with my particular broker, and the effect of different bot settings (and, to be honest, to have some fun, too :D). I will open a new demo account this evening (since the balance of the one I used for today’s test has been ‘spoiled’), so that I can start testing the EA under the conditions you have developed it for (i.e. 21.00 to 21.59 GMT with ‘[I]UsePairDefaults = true[/I]’ and the other default settings); the only setting I’ll alter is ‘[I]AvoidNews = false[/I]’. I’ll run it on EURUSD, GBPUSD, EURGBP, and EURCHF. Hehe, I know how to go about backtesting and forward testing … that’s basically the same thing I’ve done for my manual trading systems. But since you have backtested the EA extensively already and even had some versions trading live for extended periods of time, I have no intention of backtesting it all over again. I’ll run it as described in this post (i.e. with ‘proper’ settings) for some weeks, and then have a first look at its performance. Today’s run with ‘crazy’ settings was just meant to familiarize myself with EAs in general and FRP’s functions in particular. I have now reduced ‘[I]AFPM[/I]’ to 0.1, so that the three remaining open trades with ‘crazy’ settings will complete without the EA to open any new ones. As soon as the last three positions have been closed, I’ll post the results here, for fun. I’ll use your forum to publish results of the ‘real’ test, instead of doing it here. when the update will be available? can you give us some info of the new goodies this robot will be featuring with the update? Have patience my friend and fellow trader. Forex is nothing like getting rich fast scheme. The update will be available when we will be sure it works. We are not in a hurry. We have a great and tested product so there no reason for rush. If fact it wont be an update, but a completely new EA. Regarding the features, it will probably trade arround 12 pairs, on some pairs arround the clock, and also some of the pairs will feature multiple strategies. I think it will be one of the most complex EAs in the world. And the best part is that we want it to be free for existing customers. @Oliver1968, now I understood your intentions. Fair enough. Have fun testing it. Please do post the results here so we all enjoy it toghther with you. As expected, this test didn’t result in a profit. The amazing thing is how well the EA actually did, considering my ‘mad’ settings. 1.) Running XAUUSD on the EA definitely needs ‘[I]UseVolatilityFilter = true[/I]’, hehe. Gold sucked. 2.) 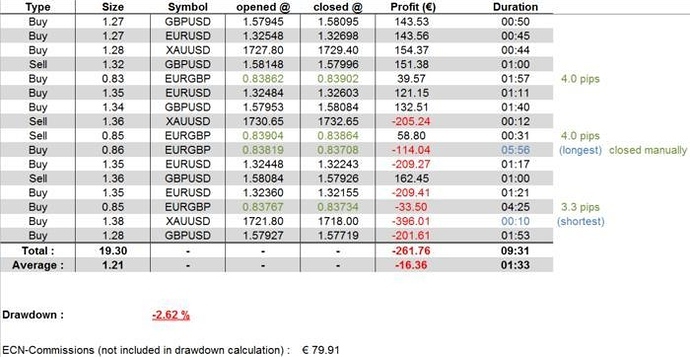 If you exclude the 3 XAUUSD trades (especially the one that has lost €396.01 because of a huge spike), the other 13 trades on recommended pairs actually earned €185.12, which would have been a 1.85% gain for the day. Considering the too tight R:R ratio (20/15) and the not-recommended trade times (09.58 GMT to 19.29 GMT) the bot stood its ground like a man. 4.) 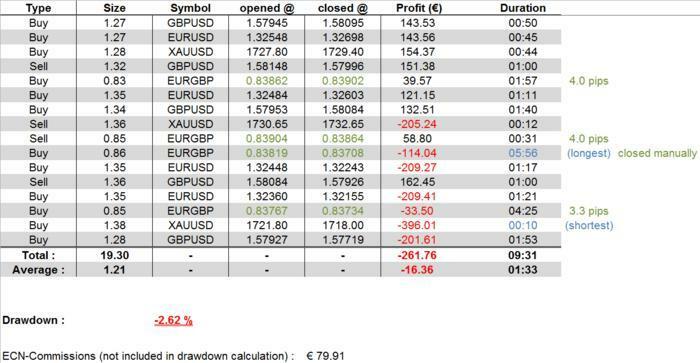 Note how the first few trades were all green and the last few were all red: London Session was ok, NY Session was a disaster (this a snapshot of a few hours, of course, and has precisely zero statistical value, but it’s still interesting). 1.) On the above spreadsheet, you notice four open/close prices marked in green; one of those has been closed manually by me, because I got tired of waiting for the S/L to be hit. (That was the last open trade, and I wanted to be done with the test.) The other three were closed by the EA, well away from the specified S/L (20 pips) or T/P (15 pips); please explain why the bot did that, instead of waiting for S/L or T/P to be hit, like it did with all the other trades. 2.) I have [I]Comments[/I] enabled on my MT4; most trades that were closed had a comment like ‘[I]Sell (#magic number) [tp][/I]’. But with some of the trades, the ‘[I][sl][/I]’ or ‘[I][tp][/I]’ was not there; at first I thought that there was a maximum time for every trade, but one of the positions was open for only 31 minutes, another one for 4 hours and 25 minutes. Are these missing ‘[I][sl][/I]’ or ‘[I][tp][/I]’ a bug or a message by the EA, indicating a certain occurrence? Okay, I have opened a new demo account, to start testing the EA properly, with default settings and trading time 21.00 to 21.59 GMT; the only thing which is not default is ‘[I]AvoidNews = false[/I]’. As mentioned before, I’ll post test results (as soon as I have a sufficient number of trades) in the EA forum, not here. That EA handles the SL and TP dinamically to better adapt to the market. It has some fixed values that sometimes are hit, but also has some dinamically adjusted SL and TP. I tell you, with ForexRealProfitEA chances to blow an account are very small. PS. I like that you understood what the AFMP was for. We have customers that trade it live that still don’t know what AFMP is for. So even with ‘[I]UsePairDefaults = false[/I]’ (which I had) the algos will still kick in? That means the S/L and T/P values are just maximum levels, not binding ones, no matter the settings, right? PS. I liket that you understood what the AFMP was for. We have customers that trade it live that still don’t know what AFMP is for. lol, thanks … I think the manual was pretty clear on it. And after having mastered SAP at its highest level (arguably the most complex software on the planet), a dozen user settings can’t confuse me. While I guess that ‘[I]AFMP[/I]’ was mainly intended to be a risk control tool, it comes in handy to stop the EA from taking new trades while open ones wait to be completed. What about my second question, the one about the comments? This really interests me (I’m terribly curious, hehe). The robot was installed on December 5, 2011 and it managed to win over 50% in two months. He managed to withdraw half of the invested money already. The risk is 10 times higher then the recommended one. Thank goodness it’s on a small account. The robot was designed for ECN brokers, so the TP and SL are not declared when the trade is opened. That is how ECN brokers work. The TP and SL are declared only after the trade is opened. In very rare occasions the TP or SL are not declared at all after the trading is opened, that is because of some connection problems, delays and other technical issues. That happens very rare. We had less then 10 trades last year without the TP and SL declared on our first real account from our homepage for example. That is not such a big problem because the robot will still close the trade on TP or SL, it’s like using Invisible Mode on “true”. The robot has no time limit for its trades. It uses indicators to open and close positions without a time limit. If it is free, it is worth nothing. Why should anybody give away a free EA? Think about it. Sometimes a statement like this has to appear. For your information we are not talking about any free EA. The only free thing here is the demo version. If you want to trade with real money you have to pay for it. You have a good day. What a singularly unqualified comment. You might want to bother getting some information before spouting unfounded opinions. the EA is not free, but the creators offer an unlimited demo version (which of course can only be used with demo accounts), so that traders can backtest and forward test it to their hearts’ content before spending money on it. By the way (and in regard of ‘free things are worthless’): I don’t know where you live, your profile does not offer this information, but here in Germany, air to breathe is free (at least it’s free yet, who knows what politicians desperate for money come up with next, hehe) … and I consider air to be quite valuable indeed, as I tend to feel slightly uncomfortable when not breathing for some minutes. This post made my day O. I can go to bed now with smile on my lips. Anyway I dont like the spikes I saw earlier on the charts. Yeah … the one trade the EA has opened yesterday at 21.58 GMT went the wrong direction by 60 pips before turning; it is currently at -21 pips. Let’s see how long it’ll take to close that position.